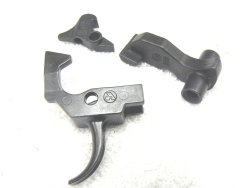 Hammer, Single Catch Trigger and Disconnector for Stamped and milled receivers. 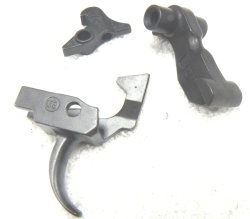 This trigger group is very smooth throughout its full range of motion. The single stage trigger has no ‘staging’ point. In other words the trigger does not come to a stop during pull, and then break after a last bit of increased squeeze. Instead it’s a very smooth, somewhat short pull with no stop to forewarn the shooter of firing. Counts as 2 US922r compliance parts.